Tibetans and supporters of Tibet across the world observed 17 May 2014 as the International Tibet Solidarity Day. 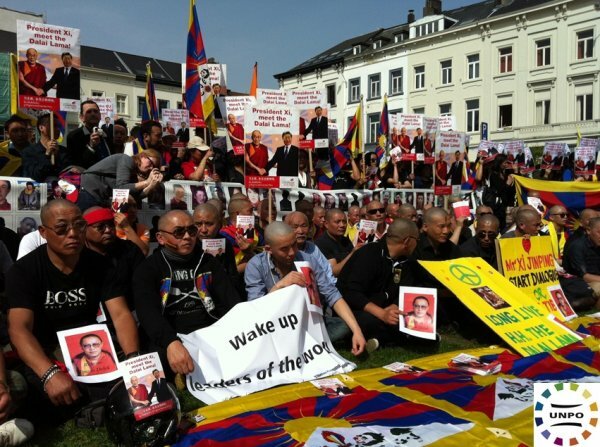 Tibetans and supporters all over the world on 17 May 2014 observed the "International Tibet Solidarity Day," to express their solidarity with the Tibetan people inside Tibet. The number of Tibetans who have set themselves on fire to protest against the Chinese government's repression has risen to 130. The cycle of self-immolation protests reflect the Tibetan people's clear rejection of the People's Republic of China's policies in Tibet which have led to political repression, cultural assimilation, environmental destruction and economic marginalization. (1) The visit of Mr Henri Malosse, the president of the European Union's European Economic and Social Committee, to Dharamshala in March this year. He expressed support for the Tibetan people's efforts to seek genuine autonomy for Tibet through dialogue with the Chinese government. (2) The annual report by the US government-commissioned United States Commission on International Religious Freedom (USCIRF), released this month. It said the Chinese government continues to perpetrate particularly severe violations of religious freedom and for Tibetan Buddhists, conditions are worse now than at any time in the past decade. (3) The report titled "Under China's Shadow: Mistreatment of Tibetans in Nepal" by the Human Rights Watch on the Tibetans suffering political and cultural repression in Nepal under the pressure of the Chinese government. (4) Appeal from South African parliamentarians to mark June 20 as the International Day for Tibet. Members of the Parliament from different political parties of South Africa, wearing Khatag (Tibetan ceremonial scarves) made the appeal in the Parliament in 2012. (5) Tibet Support Groups' campaigns to lobby action-oriented support from the governments and parliamentarians in their respective countries. (6) The statement issued by the German Buddhist Monastic Association condemning disinformation and baseless allegations against His Holiness the Dalai Lama and the Central Tibetan Administration being carried by people linked with cult associated with Dolgyal, a perfidious spirit. As this day also marks suspicious disappearance of the 11th Panchen Lama, Gendhun Choekyi Nyima after His Holiness the Dalai Lama recognized him as the reincarnation of his predecessor on 14 May 1995, the International Tibet Network and various other Tibet Support Groups have launched campaigns for the release of the Panchen Lama. We appeal to the international community to sustain a concerted effort to press China to release him and other prisoners of conscience. "The support from the international community and Tibet supporters play a vital role in putting the spotlight on the issue of Tibet on the world stage. I would like to thank governments, parliaments, Tibet Support Groups, human rights organisations, environmental groups, Tibetan Associations and Buddhist Centres for their support and solidarity. We appeal for their continued support for the Tibetan cause," Sikyong added.